Christmas is my favorite time of year! One of my favorite pastimes is baking holiday treats. But, I don’t just like to bake cookies. I’m always looking for a new holiday treat to make. 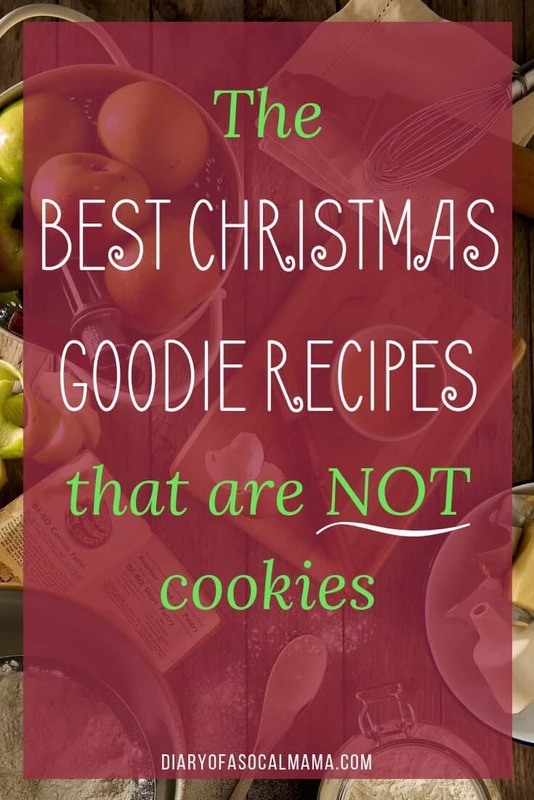 So I gathered these 23 Christmas goodie recipes that are not cookies. If you’re looking for cookie alternatives be sure to give a few of these a spin. These are perfect for your holiday grazing table, Christmas parties, Christmas “cookie” exchanges, or just to enjoy with your family! Peppermint Bark – This peppermint bark is designed to imitate the delicious tin you can buy at Williams & Sonoma. 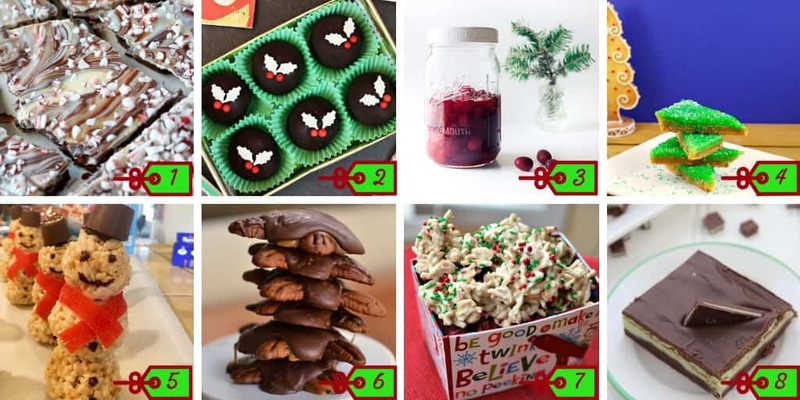 Make your own and amaze your holiday guests. Christmas Coffee Truffles – These babies combine two of my favorite things, Christmas & coffee. With this cute finish, they make a great gift! Brandied Cranberries – Add a kick to your holiday party with delicious brandied cranberries. I’d be making them tomorrow if I wasn’t pregnant! Gingerbread Lime Bars – I’m intrigued by the mix of flavors and the bright festive green color! Can’t wait to try these out on this years holiday baking day. Rice Krispie Snowmen -These cute little snowmen are great to make with the kids who will love decorating them. With some finishing touches, you can turn them into their own snowglobes and make them into adorable holiday gifts for a baking exchange. Chocolate Pecan Caramel Turtles – A little chocolate, a little caramel, and a lot of pecans make these a fun holiday treat. White Chocolate Peanut Haystacks – I love haystacks, white chocolate is always a winner to me! Don’t get my husband started on how it’s not actually chocolate! These ones are quick to make and freeze well if you want to get a jump start on your holiday baking. Andes Mint Chocolate Fudge – I love making fudge around the holidays. This one includes the loving seasonal peppermint flavor designed to mimic your favorite after dinner mint. 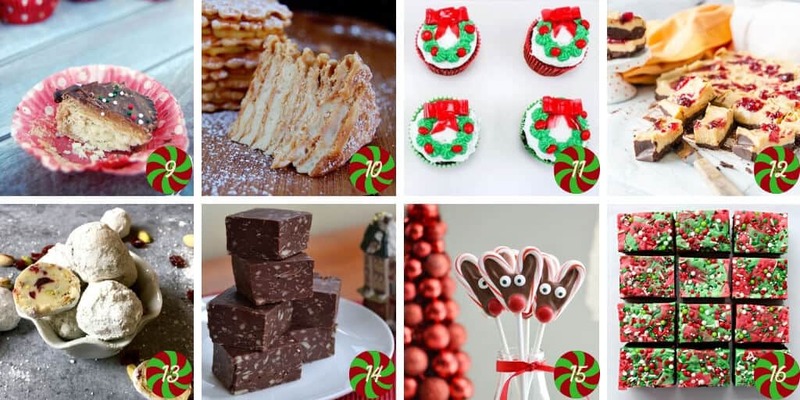 Christmas Crack Bites – Surprisingly, I’ve never heard of these! But they sound delicious and the name is tons of fun. Eggnog Icebox Cake – I’m not a fan of eggnog but my husband loves it. So I’m always looking for a new eggnog treat to make for him. This recipe is easy and no bake, which is a plus when your oven is full of cookies. Christmas Wreath Cupcakes – Break out your decorating skills for these fun cupcakes with a festive Christmas wreath on top. Pumpkin Cranberry Fudge – This one is a little bit of a fall holdover but I’m pretty sure the cranberries qualify it for Christmas as well! White Chocolate Cranberry Pistachio Truffles – A long name for tasty little treats full of Christmas cheer! Almond Joy Fudge – If you love Almond Joys you’ll love this delicious fudge! Candy Cane Reindeer Pops – These cute treats are perfect for getting the kids involved in the holiday baking. Make great treats for a classroom party too! White Chocolate Peppermint Brownies – Take delicious brownies, cover them in white chocolate in festive colors and you get these delicious holiday treats. I can’t wait to make them! Chocolate Nutella Truffles (Sugar Free) – I’m not usually one to go for sugar free treats but they had me at nutella! Pressure Cooker Peppermint Milkshake Cheesecake – I love making soup in my pressure cooker but haven’t tried it yet for baking. This sounds deliciously decadent! Snowman Cupcakes – I’m a sucker for a snowman. They’re just so cute and inevitably make me think of good old Frosty. Or maybe it’s because I’m from Southern California so snowmen seem extra idyllic, maybe I’ll get to build one someday! Candy Cane cherry cheese danish – This one will look great on the breakfast table and impress friends at a holiday potluck! Christmas Caramel Pretzels – These cuties will look great in a gift box and are simple enough for the kids to help with! Polar Bear Paw Clusters – These look so tasty. Perfect for those who love nuts in their baked goods. No Bake Key Lime minis – These festive treats are perfect for a party. 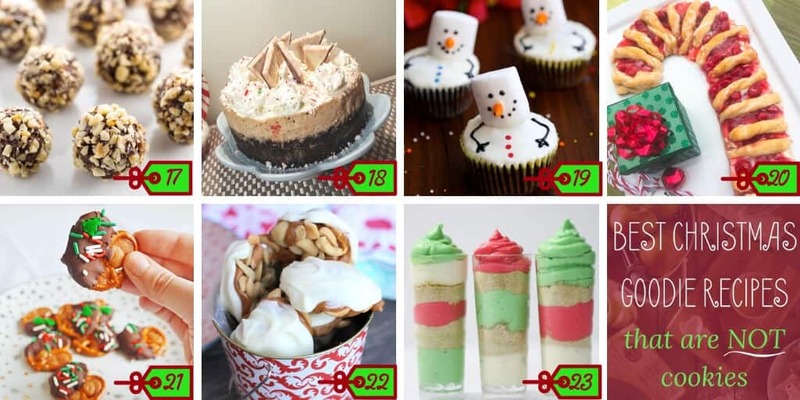 Add a little tang to your dessert table with these festive treats.